I’ve been getting a lot of questions about the Google Reader theme, and when/if I’m going to update it, so here’s an update on the update. 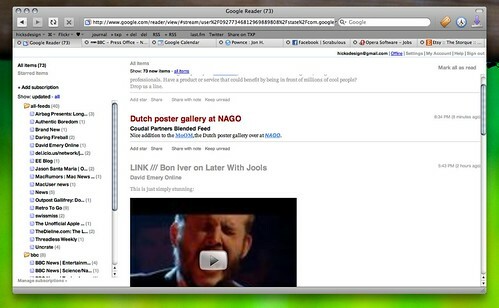 The ‘OS X’ style google reader isn’t going to updated. It’s a pain in the arse quite franky, and rather than being able to finish it off, I’m just spending my time cleaning up the mess after a new feature has been launched by Google. The code is all there if someone wants to take over the theme and carry on working on it, but I’m afraid that won’t be me! Instead, I’ve been working on something I’m calling ‘Helvetireader’, a stripped back, cleaner style, inspired by the lovely interface for Times.app RSS Reader. No rounded boxes, shadows or superfluous buttons. As there is less forced positioning going on, it should break less when new features launch. That’s the plan anyway. As it removes a lot of stuff that people might use, and only keeps the bits I use, it might not be that useful to some people. Once I feel it’s ready, I’ll release it! Previous Does this England Exist? NextGraphics Editor or Text Editor?